Musique Pour La Danse presents its latest "Collected" anthology, the label's most ambitious release since it released an extensive anthology of music produced by New Beat pioneer Ro Maron back in 2015. This time label managers Olivier Ducret (Muriaux, CH) and Ed Isar (Paris, FR) have focused on another essential Belgian producer: Dirk Desaever, the man behind White House White, A Thunder Orchestra and Danton's Voice. Rare and sought after, his records fetch high prices among collectors. Some of his productions under these aliases have appeared in crucial compilations such The Sound of Belgium series as well as Walhalla's Underground Wave, along with edits by Mick Wills for Biorythm and Marcel Dettman for Dekmantel. What was initially supposed to be a simple reissue affair soon turned into a much wider project, as Desaever shared heaps of amazing unreleased material with the label. It seemed much more interesting to shed light on the dark side of this producer's body of work, rather than to focus on content already reissued elsewhere. After listening to noisy tape rips over and over, Ducret & Isar opted to break this release down in three formats EP, LP and a cassette sold by the label direct), each one with different content. They entrusted sound engineer Lorenzo Targhetta with remastering the music and it's impressive how much he managed to polish the sound without altering the unmistakable grain of music committed to cassette tape. 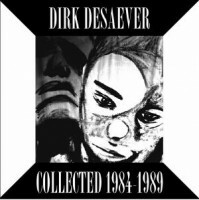 The pièce de résistance of the 'Collected 1984 - 1989' project, all the music on this LP has never been heard before, except for a single tune released on a rare 7" in 1988. The track selection and sequence is the result of Ducret & Isar closely listening to the many hours of unreleased material Desaever shared with them. The record can be approached as an imaginary album or even the soundtrack of a lost film or TV show. The idea was to tell a story about Desaever's music by highlighting its themes and variations. While some tunes can be imagined within a New Beat context, it's clear they were not created with clubs in mind. In fact, most of the material here is actually closer to minimal wave, synth wave and dark wave. With a certain gothic melancholia as the common thread running through the record, some tracks can only be described as lofi library music with a strong medieval reminiscence, others are closer to the wave aesthetic, and finally a few could even be considered ambient. Desaever's house holds many rooms, each one different from the other. After completing a grand tour of the mansion and seeing the bigger picture, it will become clear for listeners how truly unique this producer sounds, even compared with other Belgians from the 80s. Saved from oblivion and irremediable decay, the music on this LP is now just waiting to be played and listened as well as to inspire.